A liver biopsy is a medical procedure performed to obtain a small piece of liver tissue for diagnostic testing. The sample is examined under a microscope by a pathologist, a doctor who specializes in the effects of disease on body tissues; in this case, to detect abnormalities of the liver. Liver biopsies are sometimes called percutaneous liver biopsies, because the tissue sample is obtained by going through the patient's skin. This is a useful diagnostic procedure with very low risk and little discomfort to the patient. A liver biopsy is usually done to evaluate the extent of damage that has occurred to the liver because of chronic and acute disease processes or toxic injury. Biopsies are often performed to identify abnormalities in liver tissues after other techniques have failed to yield clear results. In patients with chronic hepatitis C, liver biopsy may be used to assess the patient's prognosis and the likelihood of responding to antiviral treatment. According to the American Liver Foundation, liver disease affects approximately 25 million (one in 10) Americans annually. Cirrhosis accounts for over 27,000 deaths each year. Liver disease is the third most common cause of death among individuals between the ages of 25 and 59, and the seventh most common cause of all disease-related deaths. Percutaneous liver biopsy is sometimes called aspiration biopsy or fine-needle aspiration (FNA) because it is done with a hollow needle attached to a suction syringe. The special needles used to perform a liver biopsy are called Menghini or Jamshedi needles. The amount of specimen collected should be about 0.03–0.7 fl oz (1–2 cc). In many cases, the biopsy is done by a radiologist, doctor who specializes in x rays and imaging studies. The radiologist will use computed tomography (CT) scan or ultrasound to guide the needle to the target site for the biopsy. 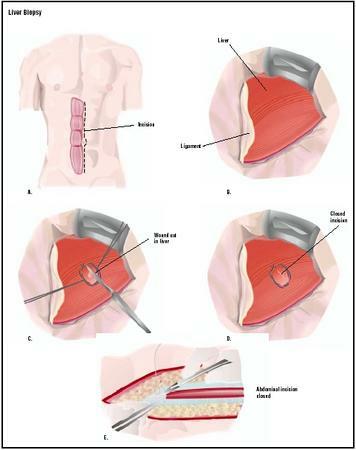 Some ultrasound-guided biopsies are performed using a biopsy gun that has a spring mechanism that contains a cutting sheath. This type of procedure gives a greater yield of tissue. (the phrenic nerve), but to remain motionless in spite of the momentary pain. The doctor will then mark a spot on the skin of the abdomen where the needle will be inserted. The right side of the upper abdomen is thoroughly cleansed with an antiseptic solution, generally iodine. The patient is then given a local anesthetic at the biopsy site. The doctor prepares the needle by drawing sterile saline solution into a syringe. The syringe is then attached to the biopsy needle, which is inserted into the patient's chest wall. The doctor then draws the plunger of the syringe back to create a vacuum. At this point, the patient is asked to take a deep breath and hold it. The needle is inserted into the liver and withdrawn quickly, usually within two seconds or less. The negative pressure in the syringe draws or pulls a sample of liver tissue into the biopsy needle. As soon as the needle is withdrawn, the patient can breathe normally. This step takes only a few seconds. Pressure is applied at the biopsy site to stop any bleeding and a bandage is placed over it. The liver tissue sample is placed in a cup with a 10% formalin solution and sent to the laboratory immediately. The entire procedure takes 10–15 minutes. Test results are usually available within a day. Most patients experience minor discomfort during the procedure (up to 50% of patients), but not severe pain. According to a medical study of adult patients undergoing percutaneous liver biopsy, pain was most often described as mild to moderate (i.e., a rating of three on a scale of one to 10). Mild medications of a non-aspirin type can be given after the biopsy if the pain persists for several hours. Liver biopsies require some preparation by the patient. Since aspirin and ibuprofen (Advil, Motrin) are known to cause excessive bleeding by inhibiting platelets and lessening clotting function, the patient should avoid taking any of these medications for at least a week before the biopsy. The doctor should check the patient's records to see whether he or she is taking any other medications that may affect blood clotting. Both a platelet count (or complete blood count ) and a prothrombin time (to assess how well the patient's blood clots) are performed prior to the biopsy. These tests determine whether there is an abnormally high risk of uncontrolled bleeding from the biopsy site, which may contraindicate the procedure. The patient should limit food or drink for a period of four to eight hours before the biopsy. Patients should be told what to expect in the way of discomfort pre- and post-procedure. In addition, they should be advised about what medications they should not take before or after the biopsy. It is important for the clinician to reassure the patient concerning the safety of the procedure. Before the procedure, the patient or family member must sign a consent form. The patient will be questioned about any history of allergy to the local anesthetic, and then will be asked to empty the bladder so that he or she will be more comfortable during the procedure. Vital signs , including pulse rate, temperature, and breathing rate will be noted so that the doctor can tell during the procedure if the patient is having any physical problems. When performing the liver biopsy and blood collection that precedes it, the physician and other health care providers will follow universal precautions to maintain sterility for the prevention of transmission of blood-borne pathogens. Liver biopsies are now performed as outpatient procedures in most hospitals. Patients are asked to lie on their right sides for one hour and then to rest quietly for three more hours. At regular intervals, a nurse checks the patient's vital signs. If there are no complications, the patient is discharged, but will be asked to stay in an area that is within an hour from the hospital in case delayed bleeding occurs. Patients should arrange to have a friend or relative take them home after discharge. Bed rest for a day is recommended, followed by a week of avoiding heavy work or strenuous exercise . The patient can immediately resume eating a normal diet. Some mild soreness in the area of the biopsy is expected after the anesthetic wears off. Irritation of the muscle that lies over the liver can also cause mild discomfort in the shoulder for some patients. Acetaminophen can be taken for minor soreness, but aspirin and ibuprofen products are best avoided. The patient should, however, call the doctor if there is severe pain in the abdomen, chest, or shoulder; difficulty breathing; or persistent bleeding. These signs may indicate that there has been leakage of bile into the abdominal cavity, or that air has been introduced into the cavity around the lungs. The complications associated with a liver biopsy are usually minor; most will occur in the first two hours following the procedure, and greater than 95% in the first 24 hours. The most significant risk is prolonged internal bleeding. Other complications from percutaneous liver biopsies include the leakage of bile or the introduction of air into the chest cavity (pneumothorax). There is also a small chance that an infection may occur. The risk that an internal organ such as the lung, gallbladder, or kidney might be punctured is decreased when using the ultrasound- or CT-guided procedure. After the biopsy, the liver sample is sent to the pathology laboratory and examined. A normal (negative) result would find no evidence of pathology in the tissue sample. It should be noted that many diseases of the liver are focal and not diffuse; an abnormality may not be detected if the sample was taken from an unaffected site. If symptoms persist, the patient may need to undergo another biopsy. The pathologist will perform a visual inspection of the sample to note any abnormalities in appearance. In cirrhosis, the sample will be fragmented and hard. Fatty liver, seen in heavy drinkers, will float in the formalin solution and will be yellow. Carcinomas are white. The pathologist will also look for deposition of bile pigments (green), indicating cholestasis (obstruction of bile flow). In preparation for microscopic examination, the tissue will be frozen and cut into thin sections, which will be mounted on glass slides and stained with various dyes to aid in identifying microscopic structures. Using the microscope, the pathologist will examine the tissue samples, and identify abnormal cells and any deposited substances such as iron or copper. In liver cancer, small dark malignant cells will be visible within the liver tissue. An infiltration of white blood cells may signal infection. The pathologist also checks for the number of bile ducts, and determines whether they are dilated. He or she also looks at the health of the small arteries and portal veins. Fibrosis will appear as scar tissue, and fatty changes are diagnosed by the presence of lipid droplets. Many different findings may be noted and a differential diagnosis (one out of many possibilities) can often be made. In difficult cases, other laboratory tests such as those assessing liver function enzymes will aid the clinician in determining the final diagnosis. Post-biopsy complications that require hospitalization occur in approximately 1–3% of cases. Moderate pain is reported by 20% of patients, and 3% report pain severe enough to warrant intravenous pain relief. The mortality rate is approximately one in 10,000. In about 0.4% of cases, a patient with liver cancer will develop a fatal hemorrhage from a percutaneous biopsy. These fatalities result because some liver tumors are supplied with a large number of blood vessels and thus may bleed excessively. Liver biopsy is an invasive and sometimes painful procedure that is also expensive (in 2002, direct costs associated with liver biopsy were $1,500–2,000). In some instances, blood tests may provide enough information to health care providers to make an accurate diagnosis and therefore avoid a biopsy. Occasionally, a biopsy may be obtained using a laparoscope (an instrument inserted through the abdominal wall that allows the doctor to visualize the liver and obtain a sample) or during surgery if the patient is undergoing an operation on the abdomen. "Hepatobiliary Disorders: Introduction." In Professional Guide to Diseases, edited by Stanley Loeb, et al. Springhouse, PA: Springhouse Corporation, 2001. Kanel, Gary C., and Jacob Korula. Liver Biopsy Evaluation, Histologic Diagnosis and Clinical Correlations. Philadelphia, PA: W.B. Saunders Company, 2000. "Screening and Diagnostic Evaluation." In The Merck Manual of Diagnosis and Therapy, 17th Edition, edited by Robert Berkow, et al. Whitehouse Station, NJ: Merck Research Laboratories, 1999. Castera, Laurent, Isabelle Negre, Kamran Samii, and Catherine Buffett. "Pain Experienced during Percutaneous Liver Biopsy." Hepatology 30, no. 6 (December 1999): 1529–30. Dienstag, Jules L. "The Role of Liver Biopsy in Chronic Hepatitis C." Hepatology 36, no. 5 (November 2002): 152–60. Moix, F. Martin, and Jean-Pierre Raufman. "The Role of Liver Biopsy in the Evaluation of Liver Test Abnormalities." Clinical Cornerstone 3, no. 6 (2001): 13–23. American Liver Foundation. 1425 Pompton Avenue, Cedar Grove, NJ 07009. (800) 465-4837. http://www.liverfoundation.org . The liver biopsy requires the skill of many clinicians, including the radiologist, hepatologist, and pathologist, to make the diagnosis. Nurses will assist the physician during the biopsy procedure and in caring for the patient after the procedure. Tissues are prepared for microscopic evaluation by a histologic technician in the pathology lab. The procedure is generally performed on an outpatient basis in a hospital. Why is a biopsy indicated in my case? How many biopsies do you perform each year? What is your rate of complications? What will happen when I get the results? What alternatives are available to me? What does it mean when the nurse said that the mass on the liver has roots? During surgery to remove my gallbladder, the surgeon noted my liver was yellow/fatty and did a biopsy. The nurse just called to tell me the biopsy was abnormal and scheduled an appointment with a gastroenterologist. However, this is not until the end of December - six weeks away. What does this mean? Is it likely that I have liver cancer? I also have a biopsy scheduled for what the radiologist believes to be benign cysts in my breast. I had breast cancer over 9 years ago and was hoping to reach my 10 year anniversary. Has the breast cancer gone to my liver? I am so scared and won't find out anything for another six weeks. Thank you. I am having a biopsy of my liver on the 24, of Jan. tomorrow, and I'm scared of the pain. Iam getting ready to have a liver biopsy monday the 24th Iam really scared. I think that if they can knock you out for a tooth surely they should be able to with the liver biopssy. I guess the thing to think about is how the results come back. I was so frightened when I read very negative comments on having a liver biopsy. It was absolutly painless. Nothing to fear. I had my biopsy done on the 8th and it was the most painfull and tramatic thing I ever went through. I felt everything and was woke without pain medication. Now I can't sleep and scared that I'm going to feel that pain again. I am going through alot mentally about what happen. You should be but to sleep. At least be told about the pain and receive something for pain. There is NO WAY I would EVER subject myself to having this procedure performed on me under the same conditions as the liver biopsy done on me Friday! First of all, the receptionist told me that they would do the same procedure as when they put the light down my throat...I thought this was strange, as I have never heard of liver biopsy being done in this manner. I decided to go have it done anyways and put my trust in what I was told by the medical professionals (I use this term LOOSELY). I was awake during the procedure and it hurt worse than any pain I have ever felt in my life (and I have 3 kids). The RN had to hold me down and it was very trauatic! The hour after laying on my side hurt so bad that it was almost unbearable at times. Now it has been almost 72 hours, and I have pain in my right shoulder, my back and also near site of incision. I have called the doctor's office to see if I need to come in there to see him or if he can call me in something for the pain. I have taken more than 10 tylenol in the last 72 hours and there is NO WAY that can be good for your liver. I WILL NEVER HAVE THIS DONE TO ME AGAIN! They didn't even really explain anything to me how it would hurt so bad. i am traumatized as well by this entire ordeal. I had a liver biopsy done this morning. Felt no pain. I was given a sedivated and plus they numb that area. Came home took a nap and now feeling pretty darn good. I had a liver biopsy done yesterday. I had one ten years ago and all they gave me was a local and it sucked. Yesterday I demanded pain meds sedatives and a local. Still my blood pressure was so high they were afraid I was going to have a stroke. That's how scared I was. But it did not hurt much at all thanks to the meds and I feel very good today. It really helps to go to a teaching hospital where the radiologist has done countless numbers of these procedures. That way you can be almost certain of a competent doctor who uses an ultrasound, pain meds and a good bedside manner. It makes ALL the difference in the world. My sister went to the hospitAL THERE WE FOUND out she had liver cerrosis she then went and had a biopsy and i was tld that her count was 3, and that she was on the boArder line. Can anyone tell me more, with the slight imformation givin? Just had my 4th liver biopsy over a period of 20 years. This one was very, very painful. The sedative they gave me must have been a placebo, because it did nothing. I had a liver biopsy done today and it was not that bad. I got a little relax meds thru an Iv, a local at the procedure site. I stayed in recovery about 4 hours afterward. It is a little sore when I take a deep breath but overall it is not bad. It wasn't a bad experience. I had a liver biopsy yesterday that was very pain full after liver biopsy i took sample to Lab but they reject the sample and they this is very small we are unable to take this for your test. I went to doctor he said to me this liver biopsy will repeat once again after one day. I am really scared please tell me what i have to do in this case is it ok that i can go for liver biopsy once again to doctors after one day or i should not go go for liver biopsy. I had a liver biopsy yesterday and it was very painful. I was crying and in so much pain even before I left the operating room. I hope and pray that I will never have to go through this again. I find out today if I need a liver biopsy, keep me in your prayers please!!. I had lverr biopsy 8 days ago. After the procedure i had sharp pain when i breath.The person who did not know why i had pain when i breath. So after 6 days my pain got worse and i went to emergency. They did x-ray ultra sound and some blood test. the doctcr told me that all tests came normal, there is no bleeding. She just gave me pain killer and told me to see my regular doctor. I had sharp pain last night that i could not sleep. So i am going to see the doctor tomorrow.otherwise during hte procedure there were no pain at all. Had a liver biopsy 2 days ago for an enlarged liver. I am not overweight and only drink seldomly. I was given an I.V. sedative, the puncture felt much like a novacaine needle for root canals. A little painful but not any worse than dental work. Had a little bit of pain at the puncture site but it gradually went away after about 48 hours. Had to lie on my side for 2 and a half hours in the recovery room. So, it wasn't that bad. Now I have to wait for the results and it is the weekend so I will call in a couple of days for the results. Had a quadruple heart bypass a year and a half ago and have felt drowsy ever since. Maybe the liver test will shed some light on this problem. Also had a brain scan a few days ago because I had a full body scan as part of a research study and some plaque was found in the occupital lobes of my cerebrum. Don't get old-I am almost 66 years old. i have a chronic liver disease, and had 6 liver biopsy's and one open biopsy since i was i born (now 20)i'm scared of having another one now that i'm older. the last one was when i was 10 and they had to put me under. i'mjust praying this one is no pain and smooth sailing. I just had my liver biopsy performed at my local hospital. It was performed by a Radiologist in a special lab set up for the test. He used a CT machine to determine the appropriate location to insert the biopsy needle. Before performing the test, they did a number of blood tests to make sure everything was good to go, like no infections, or low blood counts, etc. No fever, blood pressure, etc were checked ahead of time. They then started an IV and I was placed in the CT machine. The location was determined, the doctor asked if I was okay, he then gave me some kind of sedative and the next thing I knew, I was laying in the recovery area. It was done! I didn't feel any pain at all. I don't know why there are so many comments here about it being so painful. By the way, this is the second time I've had this performed. Neither time hurt and I didn't have ANY severe or long term discomfort at all. Those of you going in for this don't need to worry about it. It's easy and the hardest part of it is waiting for it to be done. If you read these horror stories beforehand, you're not doing yourself any favors at all. Rest easy, ask some questions, enjoy the good drugs they give you and don't worry about it!! I had a liver biopsy done a week ago due to being jaundice. All blood tests for hepatitis an other infections came back as negative and ultrasounds and X-rays showed my liver looked perfect. (I was in hospital a total of 15days before a liver biopsy was considered) It wasn't what I expected and I was only told in great deal about the procedure 5minutes before I was taken to theatre. It wasn't what I expected at all lasted a good half hour due to the doctor discussing the procedure with 3 junior doctors. The nurses were fab and made me feel calm and told me what was happening throughout. The only problem I found was the lying down on my side for 2hours then flat on my back for 2hours and then slowly moving around the room after that (I am a fidget) my shoulder was in absolute agony but I refused painkillers due to me being young (24yrs) I don't want to be dependent upon pain relievers (when I was allowed to move about I did Lots of arm stretches). As I was put at the top of the priority list in case I had to be rushed back in due to serious condition I felt confident to go home. Hopefully tomorrow when I fetch my results it will be positive as my jaundice has calmed down massively and I haven't been contacted to be rushed back in hospital. Don't fear these biopsies there in place to help YOU!! My Liver Biopsy was performed this past Friday. It was a needle biopsy using Ultrasonography. I was given an IV by a nurse which applied two types of medications, one to make me relax (anti-anxiety) and another to make me feel sleepy. These medications worked in less than 5 minutes. The Dr. used a local anesthetic at the sight of where she would be inserting the needle gun. The length of the process the doctor took using the needle gun felt like less than a minute. There was pain as penetration increased but it was bearable. The three nurses were very kind and attentive. I was sent home with specific instructions on what not to consume. To relax. And when to notify my doctor for problems e.g. bleeding, swelling, bruising, fever. I did experienced pain at the sight of the needle injection and took tylenol for the whole weekend. I experienced a fever above 100 degrees about 24 hours later. I did contact the Dr. that performed the biopsy and a nurse told me to make an appointment with my primary care provider that ordered the liver biopsy. Today (Monday) I saw a doctor with my local practice and it turns out I have strep throat. What lead up to my liver biopsy is a liver function test showed a high alkaline phosophate level. (I take many medications and have been daily for over 20 years). My primary care physcian ordered additional blood work, which lead to an ultrasound because she was concerned about my kidney function as well. This is when a mass on my liver was found. Next was the MRI and then a liver biopsy. I will have the results of my biopsy by the end of the week. Well I had my liver biopsy this morning and I'm glad I didn't read the comments on this site before the procedure or I would have been 10 times more scared than I already was. I had it done because I recently had a Transient Hepatic Elastography that came up with a Fibrosis score of F-4, which is advanced cirrhosis of the liver. I was given something to calm my nerves and some Fentynl which I did not feel at all. (Was probably water, lol) then the doctor made a mark after looking at the live shot of an ultrasound, numbed up the area where the gun would shoot the needle in for the biopsy recovery, and took about three shots at the liver. A band-aid was placed over the site, I was given a small cup of water and crackers, and was let go home in a matter of minutes from the time the biopsy was taken to the time I was in the car. The only pain I had during was a small pinch putting the IV in and a small pinch of the local numbing needle. However I felt nothing else during the procedure. Within an hour of having the procedure I felt some minor pain at the location of the biopsy, probably because they went in between my ribs to get it and some minor pain at the base of my neck where it meets with the shoulder bone. As time has gone on today the pain has increased slightly as I take deep breaths or turn in bed. I think it has leveled off though at about a 2 on a scale from 1-10 while relaxed and a 5-6 when I take a deep breath. I hope this helps someone, and I wouldn't really know worry to much about it, especially with the above comments because as I looked over them, most were left a couple of years ago and the only reasoning I can come up with for those who wrote that they truly suffered was either advances in performing a biopsy, complications, or just trying to scare people based not only on my experiences, but also in talking to the nurses there and seeing other comments on sites that are more up to date. Good luck in any case on your results as I am in more pain anticipating the results. My friend was diagnosed with Liver cancer of the common bile duct when a growth showed on the MRI. Several procedures were done to get a biopsy but was unsuccessful as they could not penetrate the duct or the growth. an ultrasound was also inserted but could not get a clear view of the growth. The doctors diagnosed it as CANCER due to symptoms of jaundice, weight loss, kidney failure and lower abdomen pain. They can not get a definitive answer but several doctors concluded that it is CANCER and nothing can be done to treat it. No chemo, radiation or any treatment - just keep comfortable and he should have approx. 4 months. He is on dialysis three times a week and very weak with blood pressure dropping when he sits up. Does this sound reasonable? I had a liver biopsy done on July 9th, 2016. I was given a sedative but I was totally awake and remember everything. I was in the hospital for 2 days. No pain meds they gave me helped. After discharge I have since been in severe pain, continuous since the biopsy on a scale of 10. Been to the ER 4 times. ER advised that it was a pain I would have to deal with. I had 4 Cat Scans to rule out internal bleeding. No bleeding found. My surgeon referred me back to my primary doctor. My primary doctor was sympathetic. He has started me on Physical Therapy. Does anybody know of anything that might help me, any input into my dilemma with this pain? It is over two months and I have NO improvement with the pain. I have been prescribed doxycycline, tramadol, valium, dilaudid. I can't continue living on pain meds which doesn't cover the pain. NOW I have drug addiction to deal with. Please respond with comments. Thank you for reading. Had one done today...the sedative didn't do a thing. The pain meds was probably water and no pain meds at discharge. This is more painful than childbirth and I had my kids naturally. I will never do this again...no matter what my doctor says! Very, very painful...hurts tobreath and move. I had a liver biopsy done 8 days ago and I'm still in pain. i dont know if it's a coincidence but i'm post menopausal for 1yr and 3mnts and i start spotting the day after.I'm very concerned because of the pain and spotting.I'm gonna c a gyno next wk I know they shouldnt b related but y do I start @ spot the day after with this pain.